I was looking through my blog last night, and I realized that I haven't posted a dessert since last September. Also, my last three dishes have been noodle-centric. I need to switch it up here, people! Well, I am happy to report that I have joined the Cake Slice Bakers, so I will be posting at least one dessert recipe every month. The Cake Slice is a group of bloggers that bake the same cake each month and post about it on the same day. I wanted to join this group because I love baking and talking about recipes, and because it gives me an excuse to make cake (the whole "buying a new cookbook thing" didn't hurt, either). Yum, cake! This month's cake is the first from Lauren Chattman's Cake Keeper Cakes, and it is the perfectly Halloween-appropriate Pumpkin and Chocolate Chip Pound Cake. I was very excited about this recipe because I adore pumpkin cake and pumpkin bars, but also a bit apprehensive about the combination of pumpkin and chocolate. The pumpkin desserts that I have had in the past have focused on warm fall spices like cinnamon and nutmeg, and have often been crowned with cream cheese icing; chocolate just didn't seem like a natural pairing. Still, I am a big fan of pumpkin, and I love loaf cakes because they are so unfussy and a good one doesn't even need frosting. This loaf cake, I am happy to report, is definitely a good one. It is so easy to throw together, and most of the ingredients were already in my pantry. The highlight of the baking process was definitely the fantastic smell that was emanated from the oven while this cake was cooking. 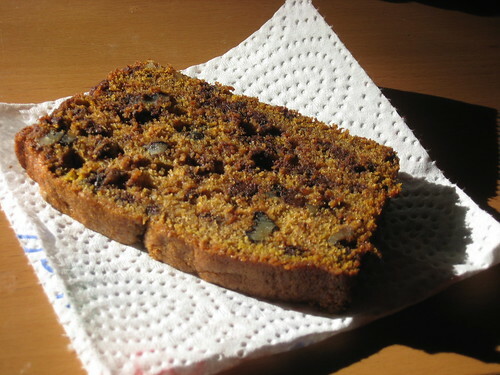 Once the cake had cooled, I sliced into it and found an exceptionally moist crumb, dense with chocolate and nuts. But that is where I ran into my only issue with this cake; I thought that it was too densely packed with chocolate. It was definitely delicious (and only gets better after sitting in its cake keeper for a day), but I found that the chocolate overpowered the taste of the pumpkin. The next time that I make this cake I will either halve the chocolate or leave it out altogether and ramp up the spices. 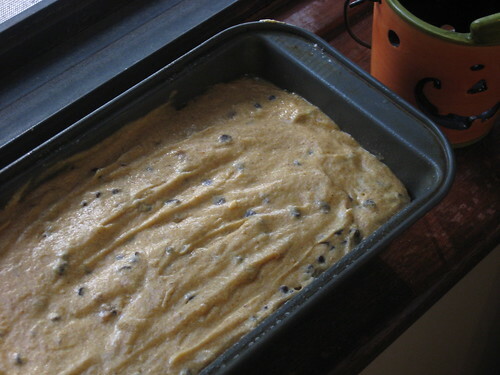 Or, I might just have to make mini loaf cakes, one plain and one with chocolate chips, because Andrew was more than happy with the chocolate-laden version. 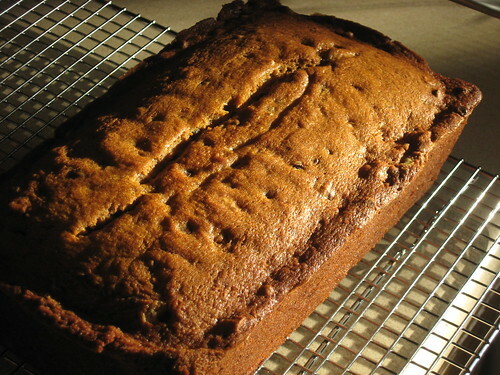 Be sure to check out the Cake Slice blogroll to see lots of mouthwatering pumpkin cakes. Heat the oven to 350F. Coat the inside of a 9 x 5 inch loaf pan with nonstick cooking spray and dust with flour. 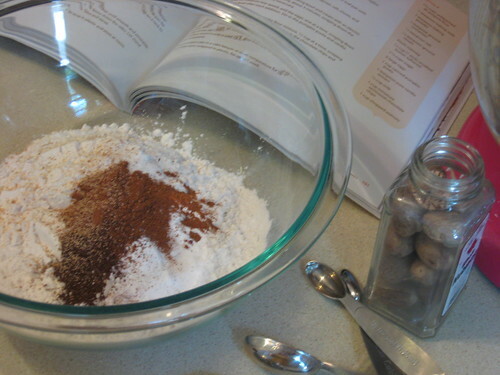 Combine the flour, baking powder, baking soda, cinnamon, salt, cloves and nutmeg in a medium mixing bowl. Combine the butter and sugar in a large mixing bowl and cream with an electric mixer on medium high speed until fluffy, about 3 minutes, scraping down the sides of the bowl once or twice as necessary. With the mixer on medium low speed, add the eggs, one at a time, scraping down the sides of the bowl after each addition. Stir in the pumpkin puree and vanilla. Stir in the milk. Turn the mixer to low speed and add the flour mixture, ½ cup at a time, scraping down the sides of the bowl after each addition. Stir in the chocolate chips and walnuts. Scrape the batter into the prepared pan and smooth the top with a rubber spatula. Bake the cake until it is firm to the touch and a toothpick inserted in the centre comes out clean, 55 minutes to 1 hour. Let the cake cool in the pan for 5 minutes, invert it onto a wire rack and then turn it right side up on a rack to cool completely. Store uneaten cake in a cake keeper at room temperature for up to 3 days or in the refrigerator, wrapped in plastic for up to 1 week. Lauren Chattman says this makes 8 servings, but I would say that it is closer to 16. It is quite rich. Your cake looks fantastic ... great photo! I love the picture on the wire rack! I agree that sometimes less is more with chocolate. Great picture! I really enjoyed the cake and suprisingly loved the addition of the chocolate. I was surprised as I am not a huge fan of chocolate in desserts. I enjoy a snickers or crunch bar every once in a while but that's about it. I think you're on to something with the chocolate amount. I reduced the chips in my second batch and preferred it that way. I was also worried about the chocolate so I used mini chocolate chips. Your cake looks great. That looks SO good! I'm not a huge chocolate fan but I didn't mind it so much in this cake. I also found that leaving the cake until the next day or so just increased it's flavor. Great job on this challenge! I agree with you, I thought there could have been less chocolate while myhusband wanted MORE! Your loaf cake looks wonderful! I have loved reading about and seeing the pictures of all of your cakes. Kelly, your photo is one of the best I've seen...really gorgeous! Mimi cakes are really fun and it does help with the chocolate overload...especially if your chips fall to the bottom as mine did.